It is estimated that 50 to 65 percent of people suffer with bad breath. This can be a somewhat embarrassing and socially inhibiting condition. Dr. Harold Katz specializes in the field of halitosis and founded The California Breath Clinics where he has helped countless folks overcome their problem. It was his background in Bacteriology that equipped him to fight bad breath at its source. Called the 'Guru of Bad Breath' you may of seen him featured of various programs such as The View and Good Morning America. Dr. Katz also published The Bad Breath Bible which has dispelled many fallacies regarding this condition. For instance it has always been believed that undigested foods or stomach problems were one of the causes of halitosis, this is false. Halitosis is actually caused by a group of anaerobic sulfur-producing bacteria that breed in the mouth. Most mouth washes and other oral hygiene products on the market contain alcohol which only exacerbates the condition. Fortunately in 1994 Dr. Katz introduced TheraBreath. These products are effective at removing bad breath because they target the root of halitosis by killing odor causing bacteria. Most products; if not all, temporarily mask mouth odors and some actually aggravate the condition. I never knew anything could remove garlic breath, yet Therabreath is effective at removing garlic and onion breath. I am actually thrilled because I consume onions as if they were apples and pop garlic like candy. I used the Oral Rinse after one of my garlic and onion binges and it really does work. The toothpaste is very different from traditional toothpastes that tend to be overpowering. Because the taste is so mild you may question its efficacy, just remember Therabreath is obliterating the problem as opposed to masking the problem. These products are also all-natural, cruelty free, green, and safe for diabetics. Finally a breath mint that does what it's supposed to do, yeah I will not leave the house without the TheraBreath Mouth Wetting Lozenges. I can now order the foods that I love without worrying about any ramifications. Whether you suffer with halitosis or just enjoy bacteria causing foods like myself, Therabreath is truly effective at ridding bad breath. Therabreath is available at your local Walgreen's, Walmart, CVS, etc. just check out their store locator to find a location near you . 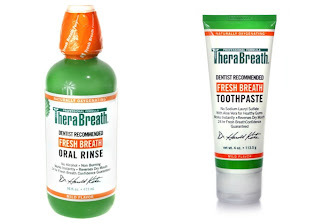 You also have the option to purchase these products at therabreath.com. 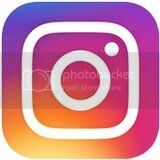 I follow you on GFC and follow TheraBreath on Twitter. I like TheraBreath on FB. I clicked the like button at the bottom of this post. I also like the TheraBrite PLUS Whitening Kit. WOULD LOVE TO GIVE YOU A TRY! my daughter is a liver transplant patient, and takes cyclosporine, which gives her "skunk" breath. We've tried everything! Literally, even vinegar and water. I'd like to try their new Probiotics! I follow you on GFC (Helena) and I follow TheraBreath on Twitter @Melahelen! I follow you on Twitter @Melahelen and tweeted! #2 I follow you on Twitter @Melahelen and tweeted! Follower on GFC. Follow TheraBreath on [email protected] Thanks for the chance. I also was intrigued by the probiotic gum. I follow you via GFC and follow TheraBreath on Twitter. Thanks! Checked out Therabreathe webpage... I thought the tongue cleaner was cool. Course I thought it is cool. Mandatory entry done. Thank you. I'd be interested in trying the PerioTherapy System Kit also. I would love to try the TheraBrite Kit!